The Amish File Cabinet with Bookcase Top organizes books, photo albums and files in style. This wood bookcase and file cabinet combo is handcrafted in the wood of your choice, easily matching existing office furniture or living room furniture with a variety of stain options available. Four spacious shelves and two lower drawers offer lots of storage and display, dressed in shaker style that is strong and simple. 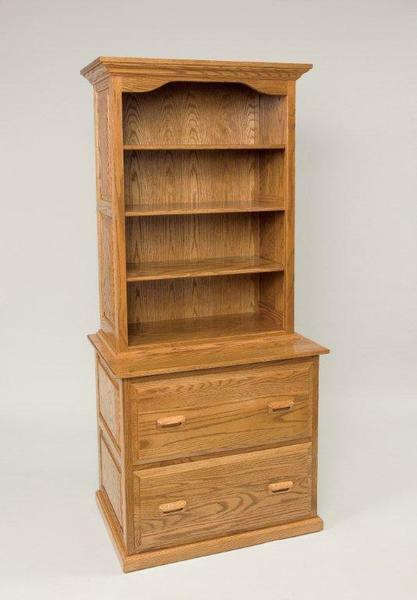 The Amish File Cabinet with Bookcase Top solves the clutter problem by supplying sensational storage for documents, reading materials and more. Amish made in America promises you top quality solid wood furniture that will last for generations. At DutchCrafters, we are proud to assist you with a team of Furniture Specialists that are knowledgeable and ready to assist you every step of the way. Please email or call with any questions about our Amish furniture. We thank you for shopping with DutchCrafters.